Although yoga has been practiced in some form for millennia, from a Western scientific perspective we are just beginning to understand the mechanisms behind its effects. Yoga is not a cure-all for physical or mental problems, but a growing body of research confirms yoga therapy’s promise to offer relief from the suffering associated with a number of chronic and debilitating conditions. * IAYT, which publishes this website, hosts an annual research conference, the Symposium on Yoga Research, and publishes a peer-reviewed journal, the International Journal of Yoga Therapy. Following are starting points for those interested in learning more about the research that’s been done to date, with an emphasis on larger, good-quality reviews and randomized controlled trials. We’ve grouped these representative studies into categories, but you’ll likely find relevant information in several spots (for example, Cellular effects and Neurological conditions relate to Seniors). Although not all yoga practices include physical movement, it’s important to know that any program that involves exercise carries an inherent risk for injury. Research suggests that yoga is at least as safe as other commonly recommended exercise programs. Cramer H, et al. The safety of yoga: A systematic review and meta-analysis of randomized controlled trials. American Journal of Epidemiology 2015;182:281–93. This textbook includes contributions from expert researchers and yoga therapists, and it “supports the emergence of yoga therapy as a credible profession.” Healthcare professionals will appreciate the summaries of research and relevant findings. Khalsa SBS, et al. (eds). The Principles and Practice of Yoga in Health Care. Pencaitland, UK: Handspring, 2016. Bartlett SJ, et al. Yoga in rheumatic diseases. Current Rheumatology Reports 2013;15. In this 8-year clinical trial, conducted at Johns Hopkins University, a well-rounded yoga program for those with osteoarthritis and rheumatoid arthritis improved pain by 40%. Participants also demonstrated overall improvement in arthritis symptoms, physical fitness, psychological functioning, and health-related quality of life. Moonaz SH, et al. Yoga in sedentary adults with arthritis: Effects of a randomized controlled pragmatic trial. Journal of Rheumatology 2015;42:1194–1202. Pan Y, et al. Could yoga practice improve treatment-related side effects and quality of life for women with breast cancer? A systematic review and meta-analysis. Asia-Pacific Journal of Clinical Oncology 2017;13:e79–e95. Sharma M, Lingam VC, & Nahar VK. 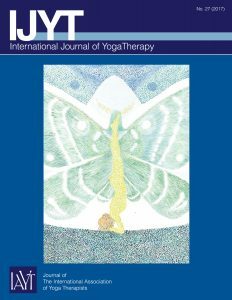 A systematic review of yoga interventions as integrative treatment in breast cancer. Journal of Cancer Research and Clinical Oncology 2016;142:2523–40. Based on 24 clinical trials, this paper suggest that clinicians consider prescribing low-intensity yoga therapy for those suffering from certain cancer treatment–related toxicities. Lin P-J, et al. Yoga for the management of cancer treatment-related toxicities. Current Oncology Reports 2018;20:1–15. This review cites consistent improvements in psychological outcomes (depression, distress, anxiety) for those practicing yoga therapy during cancer treatment. It also cites improved quality of life, quality of sleep, and immune biomarkers. Danhauer SC, et al. Review of yoga therapy during cancer treatment. Supportive Care in Cancer 2018;25:1357–72. This meta-analysis provides evidence for clinically important benefits of yoga on most biological cardiovascular disease risk factors, including blood pressure, respiratory rate, waist circumference, waist/hip ratio, cholesterol, triglycerides, and insulin resistance. Cramer H, et al. (2014). Effects of yoga on cardiovascular disease risk factors: A systematic review and meta-analysis. International Journal of Cardiology 2014;173:170–83. Dean Ornish’s team has many years of research to support the efficacy of a multifaceted lifestyle program—including yoga, meditation, nutrition, and social support—in improving cardiovascular outcomes and even reversing heart disease. Ornish D, et al. Can lifestyle changes reverse coronary heart disease? The Lifestyle Heart Trial. The Lancet 1990;336:129–33. Chaix R, et al. Epigenetic clock analysis in long-term meditators. Psychoneuroendocrinology 2017;85:210–14. Epel E, et al. Can meditation slow rate of cellular aging? Cognitive stress, mindfulness, and telomeres. Annals of the New York Academy of Sciences 2009;1172:34–53. Specialized group yoga classes are likely to be cost-effective in improving recurrent lower-back pain. Chuang L-H, et al. A pragmatic multicentered randomized controlled trial of yoga for chronic low back pain: Economic evaluation. Spine 2012;37:1593–1601. This study shows that yoga improves health outcomes, including lowered pain intensity and decreased use of opioids, for veterans with chronic lower-back pain. Groessl EJ, et al. Yoga for military veterans with chronic low back pain: A randomized clinical trial. American Journal of Preventive Medicine 2017;53:599–608. “Recent findings have demonstrated that mindfulness meditation significantly reduces pain.” The practice of meditation activates specific brain areas known to be involved in pain modulation. In this study, mindfulness meditation provided a stronger analgesic effect than a placebo or sham meditation. Zeidan F, et al. Mindfulness meditation-based pain relief employs different neural mechanisms than placebo and sham mindfulness meditation-induced analgesia. The Journal of Neuroscience 2015;35:15307–25. “After 4 days of mindfulness meditation training, meditating in the presence of noxious stimulation significantly reduced pain unpleasantness by 57% and pain intensity ratings by 40% when compared to rest.” This study also explored the impact of the practice of mindfulness meditation on brain areas associated with pain modulation. Zeidan F, et al. Brain mechanisms supporting modulation of pain by mindfulness meditation. The Journal of Neuroscience 2011;31:5540–48. Innes KE & Selfe TK. Yoga for adults with type 2 diabetes: A systematic review of controlled trials. Journal of Diabetes Research 2016. Another systematic review and meta-analysis indicates moderate evidence for yoga’s improvement of fasting glucose levels compared to standard care alone. Vizcaino M & Stover E. The effect of yoga practice on glycemic control and other health parameters in type 2 diabetes mellitus patients: A systematic review and meta-analysis. Complementary Therapies in Medicine 2016;28:57–66. This systematic review summarizes the key findings on yoga for improved immune function, including downregulation of proinflammatory markers (particularly IL-1beta, IL-6, and TNF-alpha) and enhancement of cell-mediated and mucosal immunity. Falkenberg RI, Eising C, & Peters ML. Yoga and immune system functioning: A systematic review of randomized controlled trials. Journal of Behavioral Medicine 2018;41:467–82. This review of randomized controlled trials concluded that emerging evidence supports the benefits of yoga as an ancillary treatment for depression and sleep disorders. Balasubramaniam M, Telles S, & Doraiswamy PM. Yoga on our minds: A systematic review of yoga for neuropsychiatric disorders. Frontiers in Psychiatry 2013;3:1–16. This paper, published by an interdisciplinary team including scientists at Harvard University, discusses the potential for yoga to help psychological health through self-regulation. Yoga has far-reaching potential for the treatment of a broad array of disorders exacerbated by stress. Streeter CC, et al. Effects of yoga on the autonomic nervous system, gamma-aminobutyric-acid, and allostasis in epilepsy, depression, and post-traumatic stress disorder. Medical Hypotheses 2012;78:571–79. As an affordable and relatively accessible practice with research supporting cognitive and biological mechanisms, yoga is a promising modality for depression and anxiety management. According to this review, “The current evidence base is strongest for yoga as efficacious in reducing symptoms of unipolar depression.” It outlines potential risks that may be mitigated by working with a qualified yoga therapist. Uebelacker LA & Broughton MK. Yoga for depression and anxiety: A review of published research and implications for healthcare providers. Rhode Island Medical Journal 2013;99:20–22. Zou L, et al. (2018). Effects of meditative movements on major depressive disorder: A systematic review and meta-analysis of randomized controlled trials. Journal of Clinical Medicine 2018;7:195. In this case series, side-plank pose significantly reduced scoliotic curve when practiced properly for 6.8 months. Fishman LM, Groessl EJ, & Sherman KJ. Serial case reporting yoga for idiopathic and degenerative scoliosis. Global Advances in Health and Medicine 2014;3:16–21. Lu YH, et al. Twelve-minute daily yoga regimen reverses osteoporotic bone loss. Topics in Geriatric Rehabilitation 2016;32:81–87. Ward L, et al. Yoga for functional ability, pain and psychosocial outcomes in musculoskeletal conditions: A systematic review and meta-analysis. Musculoskeletal Care 2013;11:203–17. Acevedo BP, Pospos S, & Lavretsky H. The neural mechanisms of meditative practices: Novel approaches for healthy aging. Current Behavioral Neuroscience Reports 2016;3:328–39. Meditation is associated with increased cortical thickness, a positive indicator of brain health and function. Lazar SW, et al. Meditation experience is associated with increased cortical thickness. NeuroReport 2005;16:1893–97. This paper describes ancient yoga wisdom in terms of neuroscientific topics of self-regulation and resilience. Sullivan MB, et al. Yoga therapy and polyvagal theory: The convergence of traditional wisdom and contemporary neuroscience for self-regulation and resilience. Frontiers in Human Neuroscience 2018;12:1–15. Tang Y-Y, Hölzel BK, & Posner MI. The neuroscience of mindfulness meditation. Nature Reviews Neuroscience 2015;16:213. Yan J, Kwok Y, & Hons BN. Effects of mind-body exercises on the physiological and psychosocial well-being of individuals with Parkinson’s disease: A systematic review and meta-analysis. Complementary Therapies in Medicine 2016;29:121–31. “Brief mindfulness training significantly improved visuo-spatial processing, working memory, and executive functioning.” Even just a few days of meditation training may improve ability to sustain attention, a benefit previously reported in long-term meditators. Zeidan F, et al. Mindfulness meditation improves cognition: Evidence of brief mental training. Consciousness and Cognition 2010;19:597–605. “Yoga therapy for palliative care is based on gentleness and compassion. It aims to empower the patient to accept and face the illness and death by holistic experience which has physical, mental, emotional, and spiritual dimensions.” This commentary also notes that mindfulness practices promote emotional regulation through present-moment awareness, acceptance, and nonreactivity, potentially enhancing quality of life. Deshpande A. Yoga for palliative care. Integrative Medicine Research 2018;7:211–13. Hagen I & Nayar US. Yoga for children and young people’s mental health and well-being: Research review and reflections on the mental health potentials of yoga. Frontiers in Psychiatry 2014;5:1–6. This review of 47 publications found that “yoga in the school setting is a viable and potentially efficacious strategy for improving child and adolescent health.” Yoga addresses the whole child, emphasizing a social and emotional learning model. Khalsa SBS & Butzer B. Yoga in school settings: A research review. Annals of the New York Academy of Sciences 2016;1373:45–55. Jiang Q, et al. Effects of yoga intervention during pregnancy: A review for current status. American Journal of Perinatology 2015;32:503–14. Bernardi F, et al. Acute fall and long-term rise in oxygen saturation in response to meditation. Psychophysiology 2017;54:1951–66. This study showed increased vagal function (and autonomic nervous activity), accounting for lowered blood pressure and increased heart rate variability during the yogic practice of alternate-nostril breathing. Balkrishna A. Blood pressure and heart rate variability during yoga-based alternate nostril breathing practice and breath awareness. Medical Science Monitor Basic Research 2014;20:184–93. This study on yoga for older adults showed improved functional abilities and strength. Wang MY, et al. Physical-performance outcomes and biomechanical correlates from the 32-week yoga empowers seniors study. Evidence-Based Complementary and Alternative Medicine 2016. Through neuroimaging, this study showed greater cortical thickness in elderly yoga practitioners compared to healthy age-matched controls, suggesting increased brain health. Afonso RF, et al. Greater cortical thickness in elderly female yoga practitioners—A cross-sectional study. Frontiers in Aging Neuroscience 2017;9:1–6. Huang A, et al. PD32-01 a randomized trial of a group-based therapeutic yoga program for ambulatory women with urinary incontinence. The Journal of Urology 2018;199:e645. *Understandably, most research to date has been conducted on standardized yoga and/or meditation protocols rather than on individualized yoga therapy. As the therapeutic relationship and specifically tailored practices are key to this modality, we might expect enhanced outcomes of yoga therapy compared to a more limited, less individual approach.